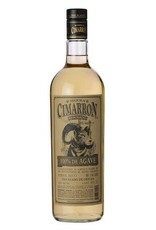 Cimarrón Reposado Tequila is 100% estate-grown blue weber agave. It's a blend of 80% tequila distilled from a double column-still and 20% tequila distilled from pot-stills. This rested tequila is bottled after aging 3 to 6 months in American white oak. With aroma's of cinnamon and baking spices continuing on the palate. There's some dark chocolate that feels soft on your palate. It's just a touch sweet with a cinnamon red hot rustic finish.